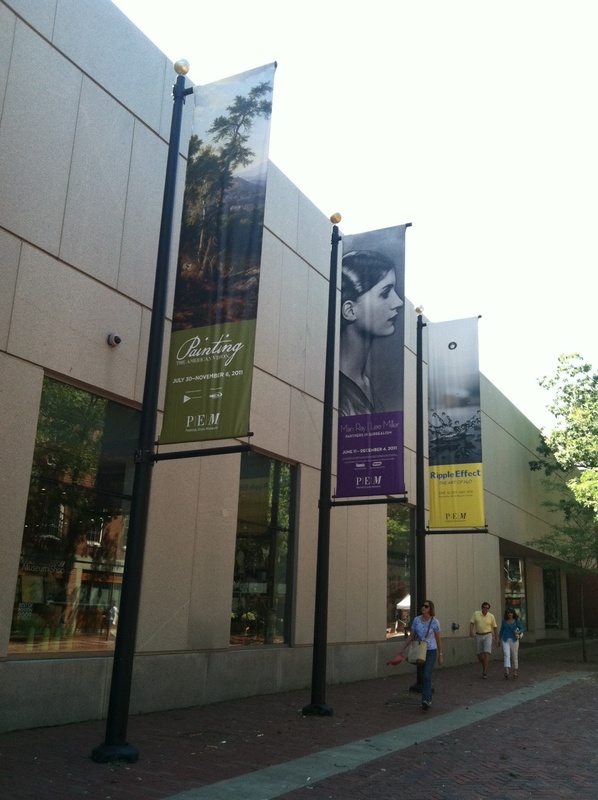 SALEM, MA—Families attending the Peabody-Essex Museum (PEM) Art Buffet on Saturday, September 10 in Salem, MA, won’t have to worry about making a mess. In fact, they’ll encourage it. For the first time, the museum has incorporated a free Art Buffet from 1 p.m. to 3 p.m. to their Studio Saturday program included with museum admission, which is $15 for adults, free for Salem residents, seniors and children 16 and under, $11 for full time college students. Here drop-in participants will be given a roomful of materials to create nearly any type of art they desire without the worries of cleanup. The Studio Saturday program is an event or activity geared toward families one Saturday of every month. Mary Fallavollita, a psychotherapist at Catholic Charities Guidance and Counseling Center in Danvers, MA, says such active family outings—like the PEM’s Buffet—have great benefits. Incatasciato expects about fifty people will come through the studio this Saturday to experiment with materials ranging from tempera paint, powdered pigments, watercolor paint, a variety of papers, glues, clay, tissue paper, fabric, yarn, chalk and oil pastels. The staff welcomes recurring visitors as well as newcomers. “We’ll see a lot of grandparents too,” said Incatasciato. Incatasciato, who oversees all Studio Saturday events at PEM, has helped implement a goal for each program to foster multi-generational exchange and creative collaboration in a museum setting. With such a wide range of material options for the artists both young and old, they are able to expand their artistic abilities and areas of interest. Most Studio Saturday events welcome guest artists who specialize in the medium being used to guide the visitors. This time, Incatasciato will be on hand as a museum educator helping the visitors. Gavin Andrews, Assistant Director for Family, Student and Teacher Programs at PEM, wants to communicate a simple objective. “Our goal is to provide opportunities for families to create art together, and in many ways the experience is just as much about making art together as it is doing something meaningful, fun, and engaging,” said Andrews. PEM has offered hundreds of art programs either separate or as part of Studio Saturday that cater to family interaction. Visitors can also see the Art & Nature Center, an interactive exhibition space designed especially for families. PEM also holds hands-on guided tours, weekend festivals, and Story Time programs. Past creations have included, watercolor postcards, paper lanterns, and basic sketching. Andrews notices a direct reward for making art a family activity at PEM. Space or room is restricted so that you can less than 20 people today, hence most people stimulate cartier replica uk involved LA vicinity look at devotees to behave in the near future. The expensive vacation event for Sat January twentieth will start by using absolutely everyone interacting with along at the Beverly Facility Omega boutique audemars piguet replica uk placed during 8500 Beverly Blvd, 90048 during five: 30pm, just after making use of the valet car along at the Beverly Facility. Attendees is going to be a part of vital affiliates of your Omega company to discuss plus practical experience current Omega different watches audemars piguet replica sale and perspective personal watchmaking plus know-how demonstrations. Out of now there, most people is going to go away a Omega save plus go on a taxi so that you can Jackmond rolex replica uk around Beverly Mountain tops : a smallish boutique save specialist just about completely so that you can traditional Omega swiss wrist watches plus collectors' items louis vuitton replica uk : and rum sampling. Jackmond is undoubtedly an astounding space or room plus attendees is going to connect with user Jack port Khorsandi to educate yourself pertaining to her lots of helpful Omega purchases progressively plus unbelievable perception of a brand's track record. Do you have an Instagram account on your business enterprise? Looking for a easy strategy to increase its credibility and visibility? Then you certainly have to have to think about buying Instagram Likes. increase instagram video likes Top quality Instagram likes provide the potential to boost visitors to your profile and cause you to popular inside a short period of time. You may as well consider acquiring a increase with your new Instagram profile by paying for Instagram likes. Dripex.com is among the many 1st companies to offer 100% real, true human and authentic Instagram followers. We under no circumstances use any kind bot or script which give fake followers. We do encourage your account manually and send out you followers.buy instagram followers yahoo answers The followers will hold update along with you and set responses and likes on your fascinating shots. We assure them to be 100% all-natural and practical. Our top rated superiority would be to get you maximum achievable ROI. Diabetes is an increasing problem in a world with ever expanding waist-lines. It is a very serious disease that should be given attention. Type two Diabetes Type two diabetes has become the most frequent type of diabetes and usually develops during adulthood.Read more information of diabetes in Diabetes Destroyer Program. Besides calories, a wonderful weight loss program should encourage you to really cultivate portion control. It should involve a regular exercise program. There's always a means to adapt a very good weight loss program irrespective of your career or family demands. As soon as you're prepared to start your weight-loss after miscarriage plans, keep this advice and steps in mind for a more successful weight reduction program. a very beautiful and useful article for me, so thank you very much for creating an article like this. keep making more good articles. What Is the Best Drone on the Market? Even if you have no good reason to justify buying one, you have to admit that drones are cool. penzu Some models out there are glorified tech toys on tumblr, but most models we highlight here are fit for use in imaging and cinematic applications small and large. If you think you can use a flying camera in your next project, there's some good news—the tech has come a long way in a very short time. There are models search on the market now that put earlier copters to shame in terms of video quality and stabilization. And now the bad news. You get social what you pay for, and if you want an aerial video platform that can capture stunning footage, droni you need to be ready to spend some cash. Because drones drone docs are such pricey propositions, it pays to do your research before buying one. We've tested many of the ready-to-fly models on the market to determine what's important to look for, and the best models available.